I came to Mineral Point, Wisconsin for the art. The tiny town among the rolling hills about 50 miles southwest of Madison is home to just 2,491 souls and 25 art galleries and studios. Any community with that much creative energy woven into the fabric of everyday life is worth a pilgrimage. But it only took a quick glance at the lovingly restored historic storefronts, handsome stone homes and beautifully manicured gardens to understand that art was only part of the story here. In Mineral Point, the city’s history, artistic tradition and culture are closely intertwined. You can absorb the city’s culture and history just by strolling down the sleepy side streets, popping in to chat with dozens of artists in their studios and dining at the mom and pop restaurants tucked away inside restored 19th century warehouses and storefronts on a High Street that resembles the U.K. more than the U.S. in both name and appearance. Mineral Point was founded in 1827 and settled by experienced miners from Cornwall, England who built small homes near the zinc and lead mines. The miners were gone and the handsome limestone houses they’d built in traditional Cornish style were crumbling by the time Robert Neal and Edgar Hellum began restoring them in 1935. Business and life partners in an era when such a relationship wasn’t openly acknowledged, Neal and Hellum were vital to the community and sparked the historic preservation that made Mineral Point what it is today. 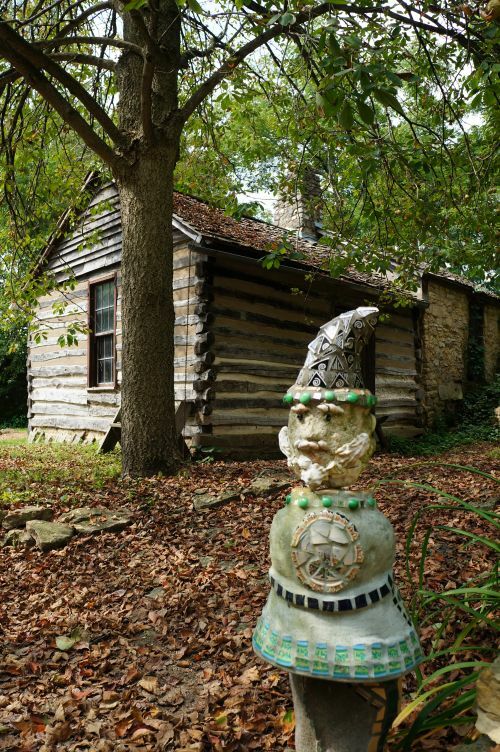 They saved a several structures, which are preserved for visitors as Pendarvis, a historic site that gives visitors a nice overview of the city’s past. (Stone from the buildings they couldn’t salvage was used to create Mineral’s Point’s stately WPA swimming pool just across the street). 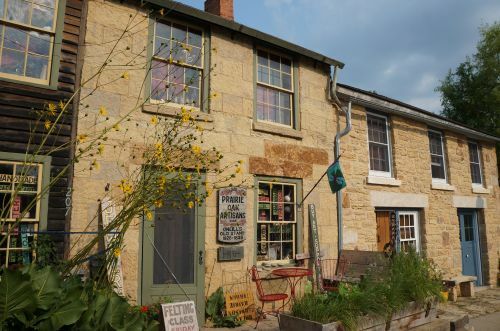 They also created gardens and operated an incredibly popular restaurant on the property, which served Neal’s Cornish family recipes until the pair retired in 1970. To try Cornish cooking today, head to Red Rooster Café, which serves pasties every day of the week. 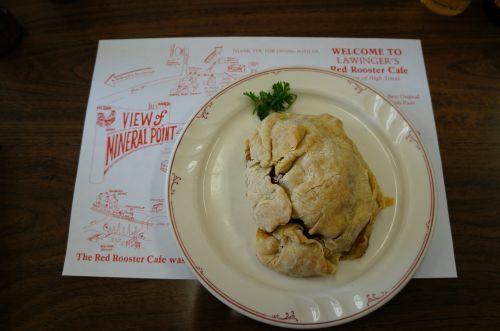 These hearty meat pies (pronounced “pass-tea”) contain potatoes and rutabagas tucked inside a thick, crimped crust designed to survive a trip down a mine shaft and are served with a mild and sweet chili sauce. The locals I met also recommended the sandwiches and salads and at Gray Dog Deli and the chewy and addictive wood-fired goodness at Popolo’s Pizza. The city’s artists and small business owners have continued Mineral Point’s tradition of historical restoration, buying and painstakingly restoring the shops, storefronts and warehouses where they live, work and sell their products. This collective passion for restoration preserved the city’s distinct architectural style and the gorgeous blonde stone of its buildings and made Mineral Point the first Wisconsin town on the National Register of Historic Places. Since artists largely own their workspaces, they’re not threatened by the rising rents that frequently plague artist-friendly neighborhoods. Meeting every artist in Mineral Point would take days, but that doesn’t mean it’s not a worthy goal. This little city is home to specialists in many mediums, including sculptors, painters, woodworkers, textile artists, quilters, glass artists and crafters. They make furniture and jewelry, accessories and needlework. If you only have time for a few stops, choose galleries that feature many artists to get a feeling for what the community has to offer. Wantoot Gallery boasts a carefully curated selection of sculptural art, upscale clothing and jewelry and eye-catching paintings, while Longbranch Gallery showcases work from over 60 artists. The Johnston family shows work from more than 200 artists at The Johnston Gallery on High Street (the marionettes on display were my own personal favorites) and also operates Brewery Pottery Studio which houses creations from more than 100 artists in a former brewery building a few blocks away. If sculptor and clockmaker Diana Johnston is in, tell her I sent you. There might be tour in it for you. May Sorum brings old fashioned letter press printing to a new generation at Mayday Press, while Kathleen Nutter’s loom at Artful Apparel & More is positively hypnotic. 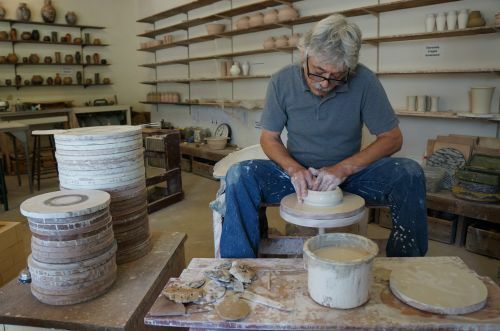 Frank Polizzi’s demos on the pottery wheel at The Mulberry Pottery are equally soothing and informative. Mineral Point is busiest on weekends, warm weather months and during festivals and special events. It’s quieter in the winter and on Mondays and Tuesdays, when many studios and restaurants take their days off, so check store, restaurant and studio hours in advance. Quiet guesthouses, boutique hotels and historic B&Bs are the norm in Mineral Point. The Mineral Point Hotel offers clawfoot tubs, a gracious outdoor patio and secure bicycle parking just steps from the Cheese Country Recreational Trail, which is truly the perfect name for a trail in Wisconsin. Craft beer fans will love Brewery Creek Inn, where you can enjoy beers brewed on-site downstairs and fireplaces and whirlpool tubs upstairs. 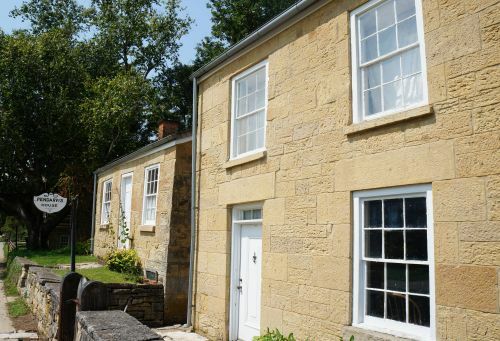 End your time in Mineral Point at Shake Rag Alley, located near Pendarvis, where your journey started. 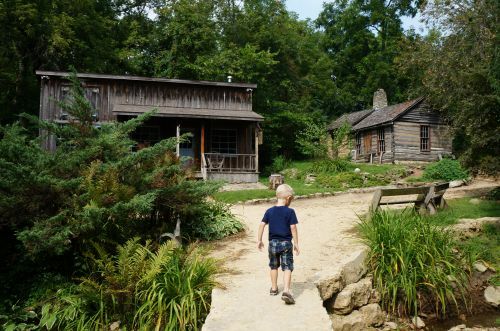 This 2.5-acre art complex offers retreats and workshops for all ages in everything from blacksmithing and fiber arts to writing and stagecraft. A spring-fed creek flows under a footbridge and past historic buildings (including the oldest structure in town), taking artists and travelers down wooded paths dotted with artfully painted rocks, forest sculptures and thoughtfully placed benches that offer a quiet place to sketch, read or think. It’s a perfect illustration of the mix of art and history that make Mineral Point so unique. Alicia Underlee Nelson is a freelance writer and photographer who covers craft beer, travel, art, entertainment, history and breaking news for Thomson Reuters, Food Network, USA Today,Delta Sky Magazine, AAA Living, Midwest Living, Beer Advocate, trivago magazine, Matador Network, KFGO-AM, craftbeer.com and numerous other publications. Her first book, “North Dakota Beer: A Heady History,” was published in 2017. Follow her adventures at prairiestylefile.com. Artists in Mineral Point and neighboring Baraboo, Spring Green and Dodgeville open their studios for the region’s marquee visual art event. Celebrate Midwestern films and indie cinema with documentaries, feature films and shorts at the Mineral Point Opera House. The city of Mineral Point welcomes the holidays with candlelight shopping, carolers, decorations and fireworks.